When you have a large list of items ( search results, products list, blog articles ). Its better to display them grouped in pages and you can navigate from one page to another through navigational elements. Its very easy to apply pagination. 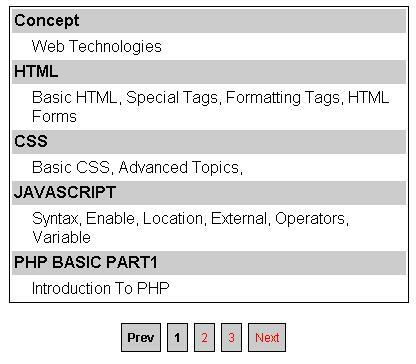 Its very basic tutorial to teach you how to apply pagination. the records starting from 0 index of the table will be returned. As we have applied limit of 5, so five records from 0 index will be returned. You need to change host name, username, password, and database name. There are two portions, items to display and navigational elements. Thanks realy helpful for me.. Thank you so much… finally i found simple pagination…. This Tutorial is Awesome.I hope all webprogrammer learn it very easy. it is very easy process to pagination. The code worked like a charm! this is very useful for beginners…………………..
Nice post man…Thank you so much…. Very simple and Very Effective !!!!! the source does not match the download !!! It is very use full.Thanks a lot…. Thank you very much ………. very useful code. it works well for me, but one error is coming. for eg: i am having a table with 19 rows. then, it should show page1, page2, page3 by clicking the Next. but with this code, Next> in page3 is also showing clickable option, so the page4 is also opening. Please help with the code. can anybody tell me how should call it ? i don’t know about php. Thank you sir..it is very useful code, first i try it but it was not working but after i write “mysql” where where you have write “mysqli” and now it is working, i am beginner in programming what is difference between mysql and mysqli . and why a team44.sql file is along with download . Code is also working without team44.sql file and what is team44.sql. check the error with this code .. Excellent code.. Thanx for sharing .. hope we will get more project from you bro.. Thank you so much!! It works and is easily portable to my web site…..i have not got your code onto my main website…but it is working great on my local site…. Excellent script thank you! how would I have just a few links rather than lots on the nav? Thank you so much Guys !!!!!! Thanks for this post! It’s working and very helpful! Good job ! worked fine for me. how to limit the number of pagination links on the above code ? please Help? Thanks for the code. It really helped me a lot. we can understand your code easily. how can we create it completely dynamic pagination using just one method function?with dynmic $table, $field, for whole site?